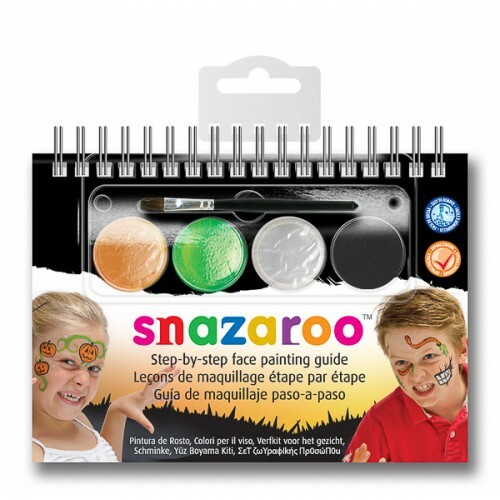 This Snazaroo Halloween Face Painting Kit is the painting set for all you horror designs. Snazaroo, your one stop face and body painting shop for all your special occasions. Whether it’s a birthday party, a play date, halloween or christmas, no matter what the occasion Snazaroo will entertain you and your children. Snazaroo face and body paints are fully compliant with the EU and FDA toy and cosmetics regulations and are formulated to be fragrance free and friendly to the most delicate skin. They are all water-based, making them even easier and quicker to remove, simply wash off with warm soapy water or use gentle face wipes. To use Snazaroo two-step Halloween guide, refer to the easy to use step by step A6 booklet provided within the set. This set contains 1 ml of Black, Grey, Green, Orange and a brush.